When the sun sets on the coral reef, a different cast of characters comes out to play. 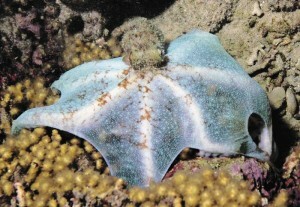 Like the denizens of Lady Gaga’s demi-monde, the creatures who come out at night on the coral reef are a psychedelic parade of colors, shapes and textures. A nighttime visit to the reef is an entirely different experience than what you find during daylight hours. 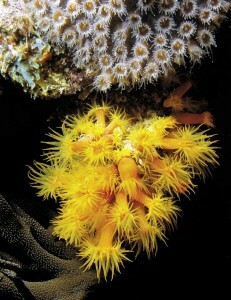 Hard corals that resemble stones by day become flamboyant showgirls by moonlight, as they shimmy and shake their boa-like tentacles to feed in the evening sea. Like nocturnal club kids, critters that are shy and elusive in the stark light of the sun let their hair down after dark. Introverted cliques of cardinal, squirrel and soldierfish become wild and wooly under cover of darkness. 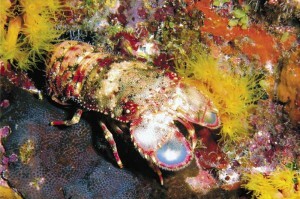 Crustaceans as a group are almost totally transformed. 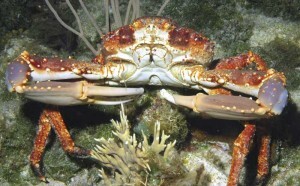 Reclusive crabs, octopi and certain species of lobsters come out of their closets to cruise the reef in search of dinner, a midnight snack, or perchance just a surreptitious hook-up. What Barbara and her dive buddies were seeing was the bioluminescent plankton that float in the water — like underwater fireflies. Marine biologists estimate that 90% of all sea creature emit some form of bioluminescence. Under certain conditions, you can actually sit in a boat, wave your hand through the water, and watch the water light up. When you’re diving, you learn early on to briefly hold your dive light over your gauges, and when you remove it, the dials glow in the dark. Bioluminescence—for my fellow language geeks — comes from the Greek word bios (“living”) and the Latin lumen (“light”). I’ve done plenty of night dives in the TCI, which are stunning because of the amazing clarity of the water. But my first-ever night dive was in Cozumel, and like many first-timers, I approached it with great trepidation (“What if my batteries die?” “What if I lose you guys?” “What if I don’t see something and it bites me?”). Yet I had heard such incredible things and was determined to tough it out. We hit the water just before the sun was setting. It was warm and calm, and we landed in a shallow sandy patch just in time to see a long-legged crab strutting his stuff across the shoal. As the light dimmed, we finned around and found a fearless octopus, presumably out for dinner. But first she was determined to give us a show: changing colors and gliding over small coral heads and letting us stroke her preternaturally soft body — normally a big no-no for divers! Later in the dive, a precious, box-shaped trunkfish literally swam into my hands and wouldn’t leave when I tried to push him away. I “handed” him to my dive buddy, who had the same experience. We actually keep little “Trunkie” with us for the entire dive. Never since have I had an experience to rival that. One of the things that’s so different about diving at night — aside from the obvious fact that the only light comes from your torch — is that your attention becomes focused on the objects in your beam of light. Fewer distractions makes it easier to concentrate on the wonders of the individual and the minuscule — like a rare orange-ball corallimorph or a tiny decorator crab perched on a soft coral, or the delicate tentacles of an orange cup coral — as Barbara did in the photos that accompany this story. 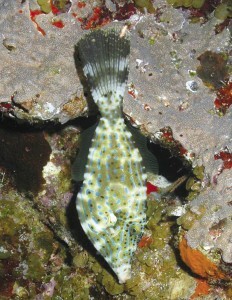 At night, under the color-correcting light of a dive torch, hues appear brighter and more vibrant. That’s because during the day, the ambient light filters out the brighter colors as they penetrate increasing depths of water. As divers, we learn that underwater, we “lose” colors according to the Roy G. Biv spectrum, meaning red is the first go. (If you’ve ever pricked your finger underwater, you’ve probably noticed that your blood looks green.) Thanks to Barbara’s strobe, the red encrusting sponge seen on page 63 is appreciably more impressive-looking than it would be in ambient light; ditto colorful regal slipper lobster on page 61. Observing the reef at night teaches us things we’d never learn if we only dived during bank hours. I was amazed to witness, for instance, about the “shift change” that happens as the light of the sun begins to fade. The half hour or so between light and dark is called “quiet time,” and it’s like trying to hail a cab in Manhattan at 4 PM, just as all the drivers are heading home. There’s next to no activity on the reef. But wait! Soon a whole new crew comes on-duty, as the brightly colored diurnal fish turn in for the night. If you don’t know what to expect, you’re in for a real treat, as Barbara was the first time she encountered feathery crinoid at night. She’d been seeing them for years, waving their tentacles out from under the edges of corals and sponges, and she naturally assumed they were anchored in that spot for all eternity. 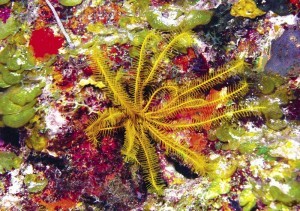 Then one night she did a dive along a vertical drop off Grand Turk and spotted a golden crinoid strolling along the wall! New York-based Suzanne Gerber writes about scuba, travel and health for a variety of publications.